Freedom is a Volkswagen Camper! Life is what you make it and for well in excess of 50 years countless motorists have been getting more out of life by travelling the highways and byways in the iconic Volkswagen Camper. For some the Camper would possibly be their introduction to a wanderlust way of life that would see them graduating to larger and still larger camper vans – I have a colleague who had to get am HGV licence to drive a massive one complete with a four-poster bed! But that’s another story. The Camper has an exceptionally strong following of diehards who appreciate the easy driving performance, the versatility and practicality of what ever version they choose to use. There is an extensive choice, as I found when talking to one of the specialist dealers after I had spent a week with the latest California Beach version. He told me that there is a great demand even for the Transporter commercial van version which is ideal for DIY fitting out for carrying surf boards, kite surfing gear, motor bikes and other sporting paraphernalia with just token attention perhaps to human creature comforts. The California Beach version undoubtedly provides for a less dramatic lifestyle, the test vehicle providing sleeping accommodation for four adults, also passenger travelling seating space for four adults but with no cooking or sanitary facilities. Yes, there is plenty of storage, both in fitted lockers and in the luggage area for all manner of equipment and once parked up the extending roof not only gives improved head room enabling one to momentary stand upright at the front section and also to access roof top sleeping accommodation additional to the double bed created by the rear bench seat. This Beach version proved an ideal touring vehicle where the user perhaps wants to stop for a picnic or perhaps cook outside on their own portable stove and utilise the pair of substantial and very comfortable folding chairs that can be found stowed in a compartment adjacent to the large tail-gate. A cost extra (£385) roll out side awning is useful for al fresco dining or one can eat in using the folding table stored in a storage chest adjacent to the large sliding off side rear door. To all intents and purposes the Beach specification creates a comfortable lounge situation with plenty of storage compartments for bedding and clothing etc. while two swivelling front seats plus the £350 investment of a third swivelling seat makes things really cosy. With any vehicle of this type, where your accommodation is also your transport, there are obvious limitations of mobility when camp is set up. The answer with the test vehicle was the provision of rear mounted racking for a pair of bikes, costing £485 plus your own bikes. Privacy is provided by black-out screening and protection from flying objects by fitted bug screens thus creating probably a slightly superior lifestyle than actually being in a tent. 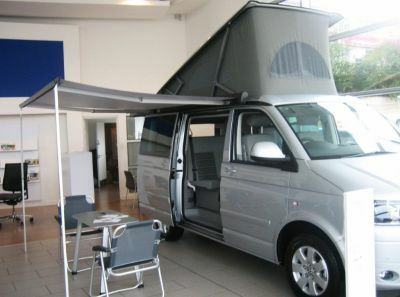 However, with distant memories of testing (and sleeping in) a Danbury converted VW motor caravan many moons ago, I visited one of a number of specific Volkswagen dealerships to check out an SE2 version costing £48,508 on the road that came complete with the kitchen sink (albeit a small plastic one), a cooker, small fridge and a just passable wardrobe, plus a few additional small storage lockers. With the roof extended reasonable domesticity is possible that would enable indoor existence in inclement weather or for short break meals in those excellent rest areas provided on the continent but rarely found in the UK. At this model level there is a lot more expertise required to operate the various items like the expanding roof, external canopy and to turn day quarters into sleeping quarters and those buyers who have waited up to 16 weeks for delivery of their vehicle are given a half-day hand-over session – though a VW spokesman suggested that a whole day could easily be taken-up with getting to know the vehicle. The really endearing character of the Volkswagen Camper, that goes back to the first examples that had a rear cooled engine, a split windscreen and a spare wheel mounted on the front, is the driveability. It takes up about the same road space as a 4x4 or a large estate car, and is easy to manoeuvre, the very comfortable driving position ensures good vision and the ‘cockpit’ layout is easy to learn and is supported by positive control functions and the usual smart and easy to read instrumentation found on all VW products. The ride is compliant, the stability a strong point, braking performance immensely capable and the 2.0-litre turbo diesel engine flexibly powerful and low on noise. The test car includes Volkswagen’s proven Bluemotion efficiency treatment that improves economy (combined figure is quoted at 40.4 mpg, so over 30 mpg with a load should be on) by the use of low rolling resistant tyres and stop+start function plus a few more hard to notice innovations. Top speed is a claimed 110 mph and at motorway paces the California is a quiet and stable cruiser, the long striding fifth gear in the easy changing gearbox ensuring a refined journey enabling easy conversation. The real performance of this vehicle and previous VW Campers is the more relaxed motoring that allows one to wander on those minor roads and tracks (an all-wheel-drive version is also offered) and to pick and choose the time and place to stop and let the world go by. A Volkswagen Camper is a vehicle for all sorts of reasons (useful even for corporate events), appreciated by the young or old and whether it is one of the Golden Oldies from the 1960s or a brand new one, it is sure to be held in high esteem and never short of a new owner. A memorable vehicle for a memorable way of life! Airport parking can be an expensive problem or an easy exercise. Business Travel News will have a really exciting announcement next week when it goes into partnership with ‘meet and greet’ provider Meteor for a substantial discount when dropping your car off at an airport. New UK car registrations in 2012 rose to a four-year high. Sales jumped 5.3% in the Olympic year compared with 2011 – to 2,044,609 new cars, the largest percentage increase since 2001. Yet again Ford stole the show and its Fiesta supermini remained top of the UK charts with sales of 109,265, nudging comfortably ahead of the second-place Vauxhall Corsa with 89,434 registrations. Finishing in third was Ford again, with the family-friendly Focus. Sales of 83,115 saw it finish way ahead of its Astra rival in fourth, with a total of 63,023 models being sold. Other top 10 finalists were the VW Golf and Polo, Nissan’s Qashqai and the Vauxhall Insignia, but yet again premium brands are muscling in to the top sales positions: the BMW 3-series and 1-series, and Mercedes C-class all figure prominently. After a positive year for the UK car market, some manufacturers enjoyed handsome sales increases: Bentley, Porsche, MG, Land Rover, Infiniti, Kia and Chrysler all saw bumper sales. However, for the likes of Alfa Romeo, Maserati, Subaru, Saab, Renault and Mitsubishi, 2012 was a year they’d probably rather forget.